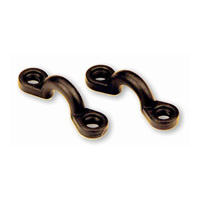 These Nylon Deck Loops are our best selling eyelets. Non-corrosive and lightweight, these deck loops can be installed just about anywhere you'd like a tie down point on your kayak. Attach to your kayak with tri-lock rivets or 1.25" 10-32 flat head screws and either nylon lock nuts or water sealing well nuts.